Ringed by mountains and home to hundreds of pot shops, Seattle is the perfect home for the active stoner. Like most outdoorsy types, the active stoner is not immune to the charms of gear. Well, forget your lightweight tents and folding cook-pots–we’ve found the ultimate camping gear! Roll Uh Bowl is a folding silicone bong that’s unbreakable and can be neatly stowed in your backpack. Plus, it’s dishwasher safe. Just what it sounds like. Surely one of the most amusing smoking devices ever invented, the gas mask hookah gets points for effectiveness and post-apocalyptic street style. Celebrate your love for bongs, booze, and craft projects by making this simple yet stylish glass bong. 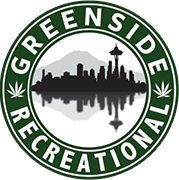 To maximize your enjoyment of these creative instruments, check out the Greenside menu, and enjoy the best legal weed in Des Moines, Federal Way, and the greater Seattle area. We now offer online ordering!